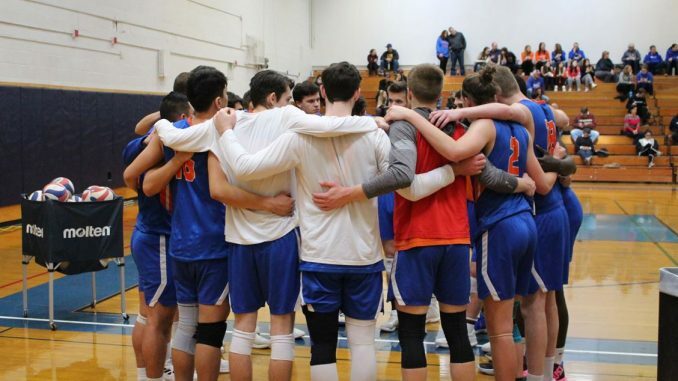 The New Paltz men’s volleyball squad dominated their most recent tri-match, defeating all four of their opponents in Nazareth College, Northern Vermont University–Johnson, St. Joseph’s College–LI and Kean University between March 30 and April 6 in the Hawk Center. The Hawks started off their most recent tri-match sweep with a 3-1 victory over Nazareth College (25-20, 25-27, 25-19, 25-18). New Paltz came out firing on all cylinders, instantly jumping out to an 8-2 lead, finished off by a pair of service aces by fourth-year outside hitter Nick Smith. With the Hawks in front 14-12, a 5-2 run that included three Golden Flyers errors pushed the lead to 19-14. New Paltz gave Nazareth some hope when they gifted the Golden Flyers three points of on a service error, bad set and attack error to near closer at 19-17. However, a 7-2 run closed out by a Smith and Carrk kill would end the set 26-19, giving the Hawks the 1-0 set lead. In the second set, New Paltz jumped out to a quick 7-3 lead on two kills by second-year middle blocker Sam Yakubowski, a kill by third-year setter Matthew Grace, a kill by Carrk and three Nazareth errors. The Hawks would hold the lead until a Smith attack error gave Nazareth the lead 12-11. Nazareth would remain in front until the Hawks took the lead 22-20 on a pair of Smith kills. It would not be enough, however, as a 7-3 Golden Flyer run closed out the match 27-25 and tied the match at a set a piece. In the third set the Hawks once again jumped out to a fast start at 7-2. From that point on, the match would go back and forth. With the score 9-7 Hawks, a 5-0 run by the Hawks created some separation. However the Golden Flyer’s would answer right back with a 4-0 run of their own to make the score 14-11. The score would remain close until the end, but the Hawks three-point cushion was more than enough to secure the victory, 25-19 and give the Hawks the 2-1 set lead. The fourth set was all Hawks. After jumping out to a 15-7 lead early, they never looked back as they built their lead to as much as 11. They would win the set 25-18 and the match 3-1. Smith led the match in kills with 16 while Grace led in assists with 38. In their final game of their most recent tri-match, the Hawks came up with another 3-0 (25-17, 25-21, 25-16) sweep, this time over No. 4 nationally ranked Kean University. The first set was competitive from the start as both teams traded points early. With New Paltz in front 8-6, a 6-1 Hawks run propelled them in front 14-7. Kean again made a push to come closer at 17-12 before a 5-2 Hawks run put the game out of reach, resulting in a 25-17 set victory. In the final set of the week, the Hawks and Cougars got out to a competitive start. However, with New Paltz up 7-6, a 6-1 run brought the Hawks lead to 13-7. Kean made a late push to close the gap to 18-15, but a cold blooded 7-1 run by New Paltz ended the set 25-16 and the match 3-0. The Hawks will play in the United Volleyball Conference (UVC) semifinals Saturday.